So far, they're not all they're cracked up to be. So far this year, we've seen LG release three pricey smartphones: the LG V30S ThinQ, the V35 ThinQ and the G7 ThinQ. (It's pronounced "thing-cue," by the way, and saying it never gets more pleasant.) The fourth, and presumably final, big device of the year is arguably the company's most ambitious. Sure, the new LG V40 ThinQ packs many of the same components you'll find in the rest of the year's high-powered flagships. It also packs a whopping five cameras (three rear and two front-facing), raising the bar for smartphone-camera insanity that you can expect to see other major phone makers embrace in due time. But what is it actually like to live with? Before we dig into that, a quick note: I've been testing one for the better part of a week, and since the software isn't quite final, we're holding off on a full review for now. With that said, I've spent enough time with the phone to appreciate what it brings to the table... and scratch my head at some of the decisions LG made here. Let's assume for a bit that you're not particularly interested in the V40 as a camera. In that case, LG's latest phone feels a lot like the rest of the high-end smartphones released this year: From the Qualcomm Snapdragon 845 chipset with 6GB of RAM to its 64GB of internal storage to its big, notched OLED screen, the V40 doesn't stray far from the rest of the pack. That's not necessarily a bad thing though. It's a remarkably fast little machine, and LG doesn't go overboard with the bloat anymore. The end result is a smooth, competent, largely uncluttered experience that I've enjoyed over the past few days. A newer version of Android would've been nice though. LG seems to have had a closer-than-usual working relationship with Google over the past few years -- that's why the LG V20 was the first to get Android Nougat two years ago and why G6 was the first non-Pixel phone to ship with Google Assistant. It would've been nice if LG had scored a similar deal and shipped Android 9.0 Pie on the V40 ThinQ, but the phone's fans will just have to wait for an update like everyone else. I've seen some people concerned about the V40's 3,300mAh battery, and that's not unwarranted -- rivals like the Galaxy S9 Plus and Huawei's P20 Pro have slightly bigger batteries. You don't need to worry too much though. The V40 easily survives a single day's use, and I've sometimes been able to use it for a few more hours after waking up before realizing I forgot to charge it. Now we're getting to the really interesting stuff. Triple-camera setups are still uncommon on smartphones. The only other device we've tested this year that had one was Huawei's excellent P20 Pro, which uses a 40-megapixel primary sensor, an 8-megapixel sensor for telephoto shooting and a 20-megapixel monochrome sensor to give photos more contrast and detail. It felt (and still feels) like total overkill, but it's an absolute blast to use. LG's approach is a little different. As with earlier V-series phones, the V40 is all about giving you lots of different perspectives. The main 12-megapixel camera has an f/1.5 aperture, and it's the one you're going to use most often. You can switch into the 12-megapixel telephoto camera and its 2x optical zoom when you need to get really tight on your subject. That third camera comes into play when you want to capture as much of the vista in front of you as possible -- it's a 16-megapixel sensor with a 107-degree field of view that LG calls "super wide angle." It's a genuinely useful tool to have, but the label feels a little disingenuous when you remember that last year's V30 had an even wider 120-degree field of view. In my experience, each of these three cameras is capable of churning out some impressive shots, though they all have slightly different personalities. The 12-megapixel main camera is arguably the most well-rounded of the three: Its photos are packed with detail and bright, if occasionally quite warm, colors. The wide-angle camera also fares well, and the photos it churns out provide ample detail and an appropriate sense of grandeur when shooting landscapes. The colors it produces are a touch more neutral and even downright cool at some points (though the phone's HDR might be making the difference a little more pronounced). The telephoto camera, meanwhile, is the one I'd rely on least. Some of the photos it churned out were a little fuzzy and indistinct compared to the wide and standard sensors. Expecting people to switch between three cameras manually can seem like a little much, but features like Triple Preview help. It offers a thumbnail-size preview of what a photo taken with each of the three cameras looks like, and it's so handy I wish it were on all the time. I can't say the same about the phone's Triple Shot mode though. It allows you to shoot a photo with all three cameras in quick succession with a single touch, but the results tend to be pretty disappointing. Here's the big issue: When you're framing up your shot, the camera locks focus on whatever's in the center of the frame and keeps that focus for each shot. That means the wide-angle shot and standard shots generally come out looking good, but zoomed photo is almost always soft by comparison. Hopefully LG fixes this over time, because right now it is so clumsy that it barely seems worth using. The phone also stitches these three photos into a short video with zoom transitions and music, but since that telephoto shot rarely looks good, I can't imagine using this often. LG's focus on flexibility extends to the two front-facing cameras as well: One is a standard 8-megapixel sensor with a f/1.8 aperture for all of your usual selfies while the other is a 5-megapixel wide-angle camera meant for group shots. Honestly, I would've preferred if both of these cameras shot at the same resolution, since wide-angle selfies don't have the same crispness or clarity as standard ones. It doesn't help that portrait mode has also been a mixed bag. The phone doesn't do a great job of telling my face apart from the stuff behind it, and some of its new backdrop features make the portrait mode's shortcomings even more apparent. By default, portrait mode fills your photo backgrounds with some nice bokeh, but it can also give you a solid color backdrop that accentuates the gaps in your hair and the occasionally odd way it separates your body's contours from the stuff behind it. This is a neat idea in theory, but the execution leaves a lot to be desired. The V40 ThinQ is a complicated phone to say the least, and there's still a lot for me to dig into before we issue our official verdict. 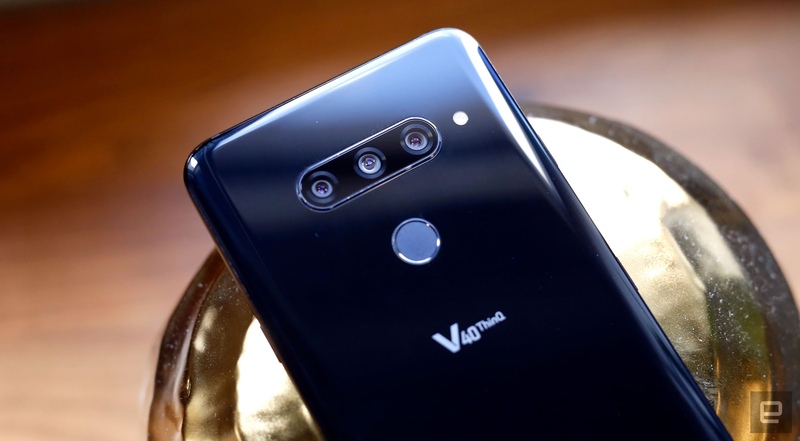 For now I can't help but be a little disappointed -- the V40 ThinQ has been an excellent phone, one that I wouldn't mind carrying around on the daily. The thing is, LG is mostly asking you to pay $900 for this phone because of its complex camera system, but it still has its share of rough edges that need to be sanded down. Here's hoping more-polished software and a little more testing time give the V40 more of a chance to shine.